Use left and right arrows to move, up arrow to check ticket. Approve or Reject each ticket based on whether they match up with the journey details at the top of the screen. 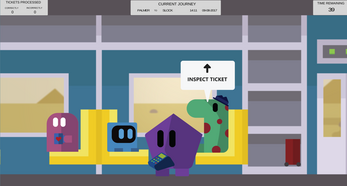 This is an incomplete game that I didn't manage to finish in time for Ludum Dare 40, was meant to involve gradually more complex "Papers Please" style document checking with more passengers and tighter deadlines. Currently the countdown doesn't do anything, there is no win or lose conditions.